★【UNIQUE DOUBLE-WALLED DESIGN INSULATION TECHNOLOGY WITH VACUUM】：Our insulated water bottle featuring double-walled vacuum insulation technology maintains temperature and keeps cold for 24hrs and hot for up to 12 hrs. Design unique, leakproof ,Cola bottle shape. ★【ECO-FRIENDLY】: It can reusable and better than plastic, easy to clean. ★【THE PERFECT DRINK IN EVERY SCENARIO】: This wildly popular bottle can be used at home, work, at the gym, for sports, hiking, camping, travelling and just about any other activity you can dream up! Product capacity - 500ml, bottle bottom wide is 6.5cm, high is 26cm and it\'s mouth is 3.5cm wide big enough for ice cubes to fit in. ★【HIGH QUALITY AND HEALTHY DRINKING】：High grade 18/8 (304)stainless steel on the inside , stainless steel material on the outside. BPA-free and toxin free for a pure taste and no flavors transferred. Reusable and refillable cold/ hot water bottle without chemical leeching. ★【LEAKPROOF】: Never worry about getting water on your desk or making a mess in your bag! The stainless steel water bottle with vacuum-seal cap provides a good seal and ensures no water leakage. 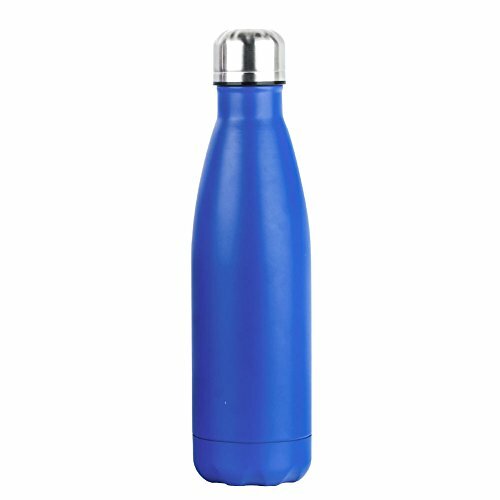 Stainless Steel Vacuum Flask Bottle. looks great, wife loves it.